Will Vulture And Harry Osborn Appear In Spider-Man: Homecoming? Hot on the heels of a leak last night that shined some light on what we could expect from Star Wars: Episode VIII, we now have another pretty big leak that highlights the plot of the upcoming Spider-Man: Homecoming. The source is 4Chan, which means it would be best to take this with a grain of salt, but there is quite a bit of information to be found here and it’s all rather interesting. There’s mention of Norman Osborn, The Vulture, Tony Stark and several other characters and elements that have been rumored and/or confirmed to be appearing in Jon Watts’ upcoming film. So who knows, it could be somewhat accurate. Then again, it also reads a bit like fan-fiction and seems almost too detailed to be a leak. Regardless, we’ll let you check it out for yourself below and decide whether or not this could be the plot of Spider-Man: Homecoming. The film begins with Spider-man thwarting a bank heist in the beginning of the morning, taking down all of the thugs except for one. The final robber and threatens to blow the head off his victim if Spider-man doesn’t let him go. Spider-man responds by doing nothing except for flashing the Spider Signal on him and threatening to summon the spiders, which scares the thug into surrendering. Peter collects pictures he took of the event to turn into the Daily Bugle after school. While the police are collecting witness statements, one woman says “Daredevil saved us!” and she’s corrected by another guy who explains that it was their friendly neighborhood Spider-man. Spidey is met with appraisal by the people of New York, and the title card appears. As soon as he takes of the costume, life starts shitting on him. Peter arrives late for school and misses a test that he is unable to make-up. He’s basically invisible to everyone except Harry and the students who think that he’s loser. Liz Allen however, who is dating Flash Thompson, seems to have a thing for Peter. Flash is obviously jealous of Peter and is constantly trying to instigate with him, but Peter never budges. Harry tries to get Peter to join the Homecoming Dance Committee that he and Liz are a part of but Peter declines, explaining that he has enough on his plate with school and making up the work he misses. After school, Peter turns in the photos to J. Jonah Jameson whose excuse for underpaying Peter is getting the pictures to him late, despite having had to go to school and being the only pictures of Spider-man foiling the robbery since the criminals took out the cameras. JJJ reveals that one of the thugs (by the name of Herman Shultz) actually got away with some of the money and JJJ twists the story into accusing Spider-man of working with the criminals, allowing them to get away before the police arrive. Peter returns home to get chastised from Aunt May who’s received a call home from school about Peter’s chronic tardiness. Peter responds by handing her the little money he got from freelancing at the Bugle. She goes easy on Peter, realizing he’s been trying to do a lot for May after losing Uncle Ben and the house. Because of his age and the city, Peter is unable to find any other work. May tries to set Peter up on a date with a friend’s niece who she’s been trying to for weeks, but Peter declines, using schoolwork as the usual excuse. Norman Osborn’s “Oscorp” boomed in productivity shortly after the collapse of SHIELD, hiring many of its scientists and resources. It is a fast growing enterprise, perhaps one of the fastest, projected to rival even Stark Industries within the next decade. Many of the world’s top scientists are employed at Oscorp, from Adrian Toomes to Otto Octavius. The former is the antagonist of the film, while the latter, among others, is just name-dropped. Toomes lives alone with his daughter and has earned the nickname of “the Vulture” for making a career out of refurbishing old or dying scientific advances in fresh, innovative ways. His newest venture is a winged exosuit based off of the technology used by Iron Man, War Machine and the Falcon. Unable to create a battery or arc-reactor powerful enough to run the suit, the proto-type is only able to run on the wearer’s vitals for a short amount of time. Osborn suggests human test trials, but Toomes argues that it would be illegal and unethical as the suit is not ready. Prolonged exposure would lead to fatally ill side-effects, causing the wearer to age rapidly after removing the suit. Osborn has the tests run behind Toomes’ back anyways, and the human subjects age rapidly just as Toomes had predicted. When Toomes learns Osborn ran the tests behind his back, Osborn convinces Toomes that the suit is a success. Though he believes Osborn, the lie isn’t enough to ethically convince Toomes to allow Osborn to get away with his crimes. He threatens to reveal Osborn as the fraud he is and in response, Osborn frames Toomes, hoping the scandal will be public enough to get the project the funding it needs. With his name slandered, Toomes himself breaks into Oscorp to destroy the exosuit. When security corners Toomes, he puts on the exosuit himself and breaks out of Oscorp. He returns home to his daughter and explains that they have to leave. She refuses to leave with a criminal, and Toomes is forced to escape alone into an abandoned warehouse that he makes his new base of operations. Though he is tempted to exact his revenge on Osborn, he chooses not to go down that path, believing he’s already done enough to slander his own name and lose his daughter. Toomes begins experiencing the side effects and accelerated aging. He plans to break back into Oscorp to get the research and technology he needs to revert the side-effects. Until then, he creates a way to reverse engineer the suit to feed off of other’s life forces instead of his own, through the talons. He uses it on rodents and small animals to keep the suit from killing him. but believe that eventually they will not be enough. Peter Parker gets into a fight with Flash Thompson for “flirting with his girl” where he decides not to fight back and Flash hits him directly in the jaw. While Parker plays the punch off as if it hurt immensely, Flash tries to play off the punch as if it didn’t almost shatter his hand. Among other issues, the fight is the last straw for Liz, and the two break up. Liz begins showing more interest in Peter, and Peter has no idea how to handle it. Peter reveals to Harry that he really has been crushing on Liz for some time, and Harry Osborn pushes Peter to make his move. Because their relationship has just ended, Peter responds that “he isn’t some kind of vulture”, following it up with “But he is.” after discovering that Toomes is attacking Oscorp. Harry is freaking out because his father might be there, but Peter has to come up with an excuse so that he can go stop Toomes. Spider-man arrives as The Vulture leave Oscorp and the two duke it out in the city. Spider-man cracks on his old appearance and tries to rips out his flight systems, but Toomes explains that the flight systems are the most well protected parts of the suit. Spidey accidentally goes for the life-support system not realizing what it is, and Toomes has no choice but to escape with what he has and begin draining the energy of innocent victims. With Oscorp’s private research and encrypted files, Toomes learns of a secret formula Norman had developed known as “OZ”. Toomes believes that if he can replicate the OZ serum once more, it can reverse the accelerated aging and cure the side effects of the Vulture exosuit. There were no human test subjects, only animals, but he believes that it works and he can be the first. Until then, Toomes begins stealing the components he believes he needs to replicate the OZ formula, knowing that soon enough his talons won’t be eventually begins to drain the life from living humans. Harry is upset at Peter for leaving when he was worried about his father, but Peter makes it up for him by deciding to join the Homecoming Dance Committee, much to Liz’s excitement and Flash’s disappointment. Flash’s hand is put in a caste after the fight with Peter, but he blames it on punching a wall because he missed Liz so much. The Homecoming Committee decides on making the school dance “Avenger” themed. While some of the faculty advise against this because of the controversy surrounding he Avengers as of late, the students outnumber the faculty and vote for theme virtually unanimously. Peter is always late to meetings because of Spider-man and the Bugle, but one day Harry offers to be Peter’s wingman and gives Peter the courage he needs to ask out Liz. Peter offers to take Liz to the Oscorp Science Fair; at first she is weary, until he explains that it’s just one of many activities at the carnival later that night. Toomes discovers his daughter Valeria is at the carnival and goes there to visit her, where he offers her the money and wealth he has been amassing for her. Valeria however shuns her father, considering him a monster for what he’s done. She rejects him and the money, and Toomes considers this the final straw before declaring revenge on Osborn once and for all. When Peter meets Liz at the carnival, the Vulture begins his attack on the carnival to find Osborn. Spider-Man is forced to appear and battle Vulture, who gains the upperhand this time around. Osborn tells Toomes what he already knows, that the OZ formula was tested on various animals and never given human trials, and it was a failure. Toomes tells Osborn that he’s turned him into a monster in the eyes of his daughter, and Osborn explains that he’s done that himself. The suit’s upgrades keep Peter from damaging the life support system same way as before, and Toomes uses his talons to drain Peter’s energy, restoring youth and granting strength like never before. While Peter doesn’t age, he is weakened immensely. Osborn makes his escape, causing Toomes to leave. Tony unexpectedly picks up Peter from the carnival, and the two discuss Toomes on the way home. Stark reveals that he doesn’t trust Osborn, and not just because he leads a rival company. The Accords keep Tony from directly helping stop Toomes, but he he can indirectly help Peter. Peter asks for schematics on the Iron Man and Falcon suits, and Stark tells them they’re a little to advanced for him. When he shows them to Peter on a holoprint, Peter blows Tony away by understanding the tech immediately and building Toomes’s suit from scratch. On the drive home, Peter and Tony figure out how to create an anti-magnetic inverter to stop Toomes without killing him. Peter also discusses the difficulty of balancing his responsibility with living a normal teenage life. Right before he drops him off, Stark also reveals he saw Peter spill the spaghetti with Liz and gives him some advice on how to deal with women. When Peter asks what Tony looks for in a woman, Tony says redheads. Peter says it’s a shame he doesn’t know any. Aunt May tries to set Peter up with a date to the Homecoming Dance, but Peter as usual doesn’t trust his Aunt and rejects it. After the weekend is over, Flash berates Peter in front of Liz for being too afraid of the Vulture to stay with her at the Carnival, to which Peter immediately responds by asking her to the Homecoming Dance. Liz accepts the invitation, and Flash is left looking like a fool. The night of the dance, Peter receives a package from Stark containing the inverter. He stuffs it into his pocket and heads out to the dance to meet with Liz. Shortly after he arrives, The Vulture crashes the Midtown High Homecoming Dance to kidnap Harry. Peter switches into his Spider-man costume and realizes that the inverter is in his dress pants’ pockets. He fires at the roof of the school to try collapse the gymnasium. He uses the distraction to take Harry and escape. Spider-man is able to save everyone in the gymnasium, and seeing that Liz is alone, assures her that Peter made it home safe. He webs her hand to Flash and tells them to make up. Liz is grossed out by the webbing, while Flash states that he’s never washing his hand again. Spider-man heads over to Oscorp to meet with Norman who’s just recieved a message from Toomes with directions to his abandoned warehouse, telling him to go alone. Norman follows his orders and Spider-man stays behind at Oscorp to fix the inverter. When Norman arrives, Toomes shows Harry all of the illegal experiments that Norman was responsible for. At first Harry backs away from his father, until his father twists the facts and explains everything he’s done is for him and the memory of their mother. Harry forgives his father, and with his plan in shambles, Vulture prepares to kill Norman Osborn. Spider-Man leaps in the way, just in time, giving the Osborns ample time to escape. 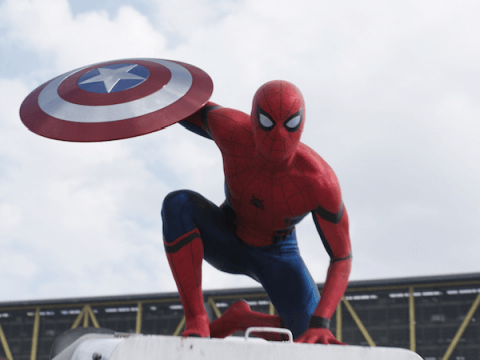 Peter takes the battles into the skies and throughout New York City, even passing by the old Avengers tower. The battle ends near Oscorp when Peter uses an amplified version of the inverter, and Toomes is caught in between two buildings like a fly caught in a web. Liz gets back together with Flash. As a result, however, Flash’s dislike for Peter has been replaced with a fanboy love for Spider-man. Osborn destroys all evidence that could ruin his name, and Toomes is put in jail. Toomes is visited by Osborn and says it’s only a matter of time before the public realizes what Osborn really is and he ends up in prison with Toomes. Osborn responds by saying that perhaps one day he can find it in his heart to forgive Toomes, and maybe, just maybe, he’ll allow him to work for him again. Peter arrives at the new Homecoming dance with Mary Jane to find that this time around, the dance’s theme is Spider-Man. The midcredits scene is Osborn rewatching video footage of Peter Parker getting bitten by the spider during a field trip to Oscorp. He has been tracking Peter’s progress during all of this time.